Say what?!? These cupcakes just SCREAM St. Patrick’s Day – at least to me. They are like black-and-white cookies but cupcakes!! YUM! 1 recipe Irish Cream Ganache – In a small saucepan bring whipping cream just to boiling over medium-high heat. Remove from heat. Add chocolate (do not stir). Let stand for 5 minutes. Stir in liqueur until smooth. Cool about 15 minutes or until slightly thickened. 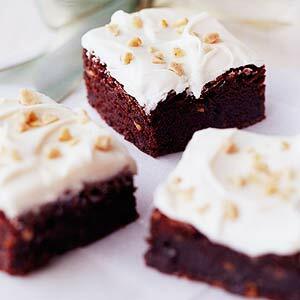 1 recipe Irish Cream Icing – In a small bowl stir together powdered sugar, liqueur, and vanilla. Allow vegan butter and egg whites to stand at room temperature for 30 minutes. Meanwhile, grease and flour twenty-eight 2-1/2-inch muffin cups (or line with paper bake cups). In a medium bowl stir together gluten free flour, baking powder, baking soda, and salt. Set aside. Preheat oven to 350ºF. In a large mixing bowl beat butter with an electric mixer on medium to high speed for 30 seconds. Add sugar, liqueur, and vanilla. Beat until combined, scraping sides of bowl occasionally. Add egg whites, one at a time, beating well after each addition. Alternately add flour mixture and buttermilk substitute, beating on low speed after each addition just until combined. Transfer 2-1/2 cups batter (about half) to a medium bowl; stir in melted chocolate. Fill each prepared muffin cup about two-thirds full, spooning chocolate batter into one side of cup and white batter into other side of cup. Bake about 20 minutes or until tops spring back when lightly touched. Cool cupcakes in muffin cups on wire racks for 5 minutes. Remove cupcakes from muffin cups. Cool completely on racks. 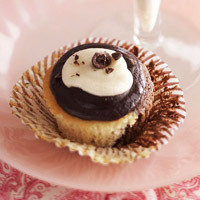 Spread Irish Cream Ganache onto tops of cupcakes. Let stand at room temperature about 1 hour (or chill in the refrigerator about 15 minutes) or until ganache is set. Spoon Irish Cream Icing onto centers of cupcakes. Let stand until icing sets.